I started watching "Anthony Bourdain: Parts Unknown" on CNN recently. I kind of like his nonchalant approach to food as he immerses himself into the culture of the area of the world he's visiting. I don't have a strong desire to travel to other countries, preferring to see my own country, the US, through road trips. I realize I'm missing out on other cultures, but I just can't justify traveling the world without seeing America first. Anyway, Anthony Bourdain's show is now a must-watch for me, and I saw the episode about Libya recently. It is incredible and scary what happened in that nation, but it is amazing, too, that the people believed that they would improve their lives by deposing the horrible dictator, Muammar Gaddafi. In many ways, they have improved themselves, however the unrest in the country, as the show explored, is a bit unnerving. There seems to be danger everywhere, and it really is chaotic. I just can't imagine. We, in the USA, are incredibly blessed to live in freedom. The Libyan people had to fight for theirs. 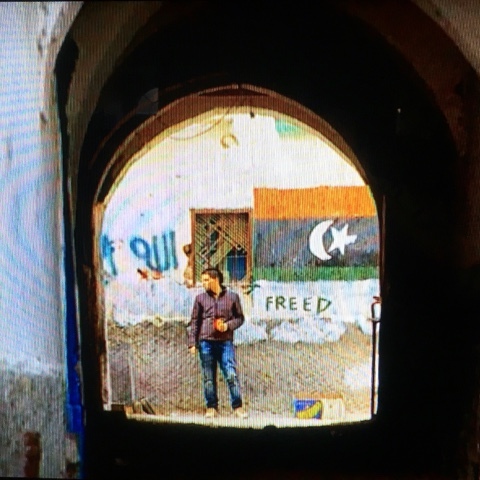 At one point, the camera pointed through an alley and there was a young man standing against a graffiti-ed wall, a painted Libyan flag and the word, "FREED," next to him. I snapped a picture of the screen shot, hoping to make a joke out of the use of my last name, but I imagine it really has a very strong meaning to the Libyan people. Freedom has so much more meaning in the rest of the world. I think we Americans take ours for granted. We shouldn't. What we should do is take responsibility of our freedoms and make the world a better place. I know that sounds hokey, but every one of us can do more. Make a difference. If you don't know how, have a conversation with a neighbor you don't know and watch the doors that open, and opportunities that appear.